SINGAPORE (Feb 17): Oil prices edged up on Friday, lifted by a report that producer club OPEC could extend an output cut aimed at reining in a global fuel supply overhang. Brent crude futures were trading at US$55.76 per barrel at 0311 GMT, up 11 US cents from their last close. 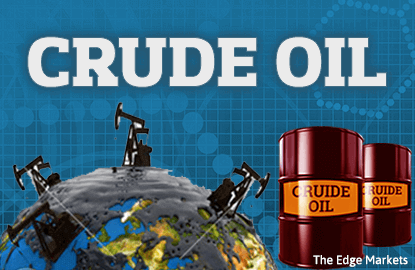 US West Texas Intermediate (WTI) crude futures, were up 10 US cents at US$53.46 per barrel. The Organization of the Petroleum Exporting Countries (OPEC) and other producers including Russia plan to cut output by almost 1.8 million barrels per day (bpd) during the first half of 2017, and estimates suggest compliance by OPEC is around 90%. To help rebalance the market, OPEC sources told Reuters that the supply reduction pact could be extended if all major producers showed "effective cooperation". For now, inventories remain bloated and supplies high, especially in the United States. Recent price movements reflect this, with Brent and WTI trading within a US$5 per barrel price range this year, in what has become the longest and most range-bound period since a price slump began in mid-2014. In Asia, oil flows into the region remain as high as they were before the production cuts, data in Thomson Reuters Eikon shows, as exporters shield their big customers in a fight for market share. This comes amid signs of stuttering demand growth in core markets, China and India. In India, fuel demand growth fell in January, while in China sagging car sales and soaring gasoline and diesel exports also point to a slowdown in growth. That leaves Europe, where OPEC has significantly cut supplies. However, Eikon data shows rising North Sea oil exports to Asia, indicating there is no real supply shortage there either. Despite the ongoing glut, analysts expect oil markets to tighten in the longer term. "If oil prices stay around US$60 per barrel and GDP growth over 3% per annum, then oil demand growth will be stronger over the next 5 years, than the previous decade. What we are witnessing is a rather surprising renaissance of oil consumption," it added.